Slow and easy wins the race. Crock pots allow the chef to make a meal ahead of time and plan the rest of the meal. Fish are especially tasty when cooked to slow and tender perfection. Since fish normally cook quickly, crock pots help to slow the cook down. Here is a great crock pot fish recipe to enjoy your filet bounty! Paprika or Old Bay seasoning to taste. DIRECTIONS In a large skillet, sauté the onion in butter. Transfer to a 3 qt. slow cooker and add the milk. Next add in the Ranch Dressing, fish, broccoli, cheeses and spices. Cover and cook on high for 1-2 hours until the soup is bubbly and the fish flakes easily. Add some fresh bread and a salad and your delicious meal is complete! 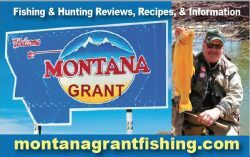 For more Montana grant visit him on Facebook at Montana Grant Fishing and Hunting.